It’s not that Australian horror hasn’t been worthy of talking about; it’s that availability has been wanting due to limited distribution and the ravages of time that crumble many a worthy release. 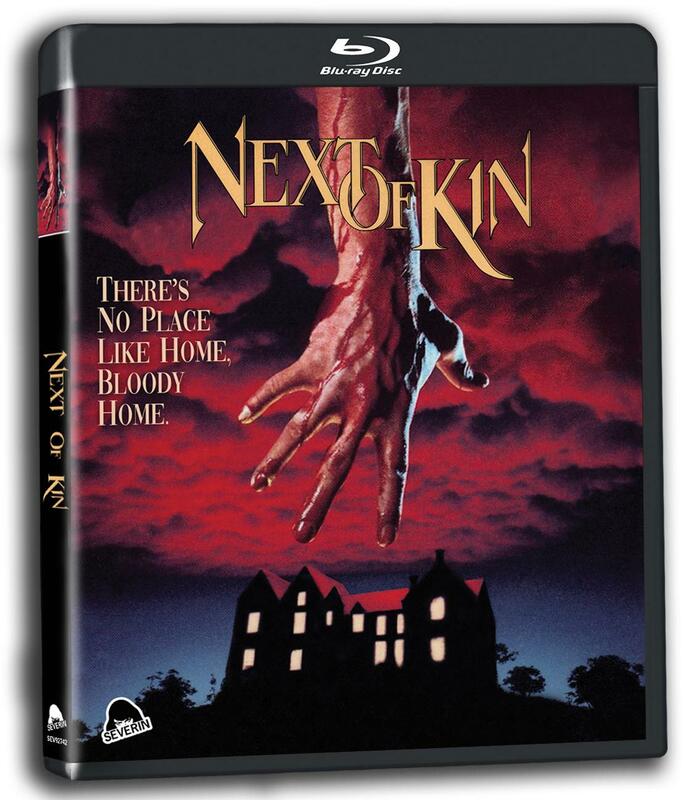 But this is a new age, and I’m thankful that companies like Severin Films are around to revive top-notch efforts like Next of Kin (1982), a surreal and haunting Italian-flavored genre piece that more than earns a revival. The story goes like this: Linda (Jacki Kerin – The River Kings) returns to Monteclare Retirement Home upon the death of her mother, who has left the entire property to Linda. Overwhelmed at the prospect of running such a huge operation, she leans on head nurse Connie (Gerda Nicolson – Gallipoli) and Dr. Barton (Alex Scott – Romper Stomper). Familiar faces from her childhood, they offer a guiding hand in Linda’s transition as she reacquaints herself with her old home, and her old boyfriend, Barney (John Jarratt – Wolf Creek). She also gets to know her late mother better once she discovers her diary; in it, her mother believed the property to be haunted, as several of the residents died under mysterious circumstances. It isn’t long before events in the present day start to mirror her mother’s writings, and Linda finds herself in danger as she tries to deal with increasing paranoia and vivid delusions. Is Linda going mad, or is the home truly haunted? Like many horror fans, Next of Kin first came on my radar while seeing clips of it in Mark Hartley’s excellent documentary about the Australian film scene, Not Quite Hollywood (2008); highlighted are some of Linda’s delusions and beautiful Steadicam work. Quentin Tarantino mentions the film favorably with The Shining, and truth be told, I find Next of Kin to be more effective in what it sets out to do. Deliberately measured, Next of Kin rolls out its story slowly; we’re right along with Linda as every little discovery feels like a fundamental brainshake to her senses. Director Tony Williams chooses to propel the tale through striking visuals rather than unnecessary exposition; the film is a journey that he controls, and as it accelerates to the show-stopping final act, he expertly calibrates the screws to turn with maximum efficiency. While Williams told DP Gary Hansen (Harlequin) to study the films of Bertolucci to achieve a look of grandeur and depth, truth be told, the film ends up feeling like a lost Argento with bold shots and expressive camerawork (perhaps a common inspiration?). It is this elegance applied to a story filled with Gothic touches (the estate itself is a formidable character) and occasionally arch delivery that gives it that Italian feel, but there’s also a touch of Tobe Hooper’s wild-eyed anarchy present in the final reel that truly sets it apart. Next of Kin is undeniable proof of the power in image, and a simple story well told. The extended interviews with Williams and Jarratt are good, with the former especially expounding on the industry and why the film didn’t perform as it should have. Return to Monteclare is a pretty travelogue of the estate where the movie was filmed, and House of Psychotic Women is a solid intro to an upcoming series. The two separate commentaries are the real gems, however; the first with Williams and producer Tim White highlights the technical prowess behind the scenes as well as the struggle to get the film made, while the cast commentary is lighter, breezier, with warm remembrances of the filming. Put together, they offer a very well-rounded picture of the production. I hope that Next of Kin will continue to be discovered, and Severin Films has more than done their part to ensure it does. Regardless of time and circumstance, it’s a visually stunning shocker that pulses through the consciousness long after the screen fades to black and the madness ends.